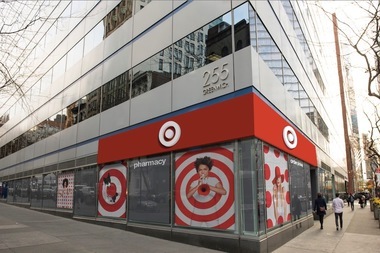 A Target location at 225 Greenwich St. in TriBeCa is set to open this October and the retail giant is preparing to open one on East 14th Street as well, according to property records. EAST VILLAGE — Target is preparing to open a new East 14th Street location. The retail giant has inked a lease on a commercial space attached to a development at 500 E. 14th St. from the Extell Development Company, according to property records which became public on Friday and first reported by The Real Deal. The developer is currently building a seven-story residential and commercial site spanning 500 to 524 E. 14th St., between Avenues A and B, bringing two retailers and 160 apartments to the area by 2017. Thirty-two of the units will be below market rate. The department store will take over one of the two retail spaces in the development. Trader Joe's is eyeing one of the spaces, Extell’s vice president of development told DNAinfo New York in May, but Extell reps did not immediately respond when asked if the grocer was still considering signing a lease. Target, which already has a Manhattan location in East Harlem, is rolling out a new TriBeCa spot in October, which will have a "Chobani Cafe" with a Greek yogurt bar. Target's corporate office did not immediately respond to a request for comment.